Also set the file association to "none", finding myself having IV associated to many file types. Some of them, already associated with other programs seem to remain untouched (I have .bmp with Paint.net for example which avoids the 'hijack'). If I go to "Default Programs/Set Default Programs/Control Panel list" and look for IV, I see that many boxes are checkmarked but I can't uncheck any of them (I have administrator privileges). Using specialized tools (like Default Programs Editor) didn't help. Haven't check using portable installation yet. That screenshot confirms what we've been saying here. IrfanView extension associations are all shown 'unticked' but Windows > Default Programs clearly show that all the image file types have been 'hijacked' by IrfanView v4.52. I suspect that the difficulty in reverted it back is a Windows issue though. I've just checked that Default Programs/Set Default Programs/Control Panel list myself and with my still installed v4.51 my GIF default (IrfanView 64) is the only one ticked but you can not 'untick' it. I opened IrfanView, unassociated GIF, saved, restarted the PC, checked it was still unassociated then went into Windows default programs and it was still ticked there and could not be 'unticked'. This is typical of Windows unfortunately ie. being able to associate programs fairly easily but not allowing you to unassociate them as easily forcing you to use a third party tool like Default Programs Editor or editing the registry. So in the case of IrfanView v4.52, except by using a restore point or an imported registry backup made before the 'hijack', it seems that you are stuck with having to unassociate each image file type individually. I never looked at what other image file type associations v4.52 'hijacked' assuming it was just the main ones JPG, PNG, BMP and PDN but, obviously, it is much more than that. It makes me even more pleased that I had a restore point to go back too. But I feel for those who do not because they appear to have quite a bit of work to do if they want to unassociate everything. 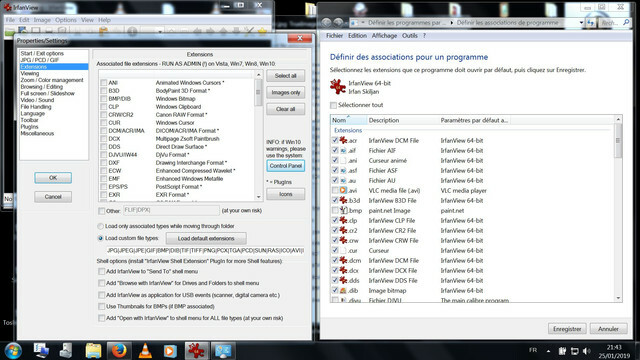 This bug is for v4.52 32bit on a Win7 64bit Pro FR. The installation was a first one (no Irfanview before). NO extension selected => IrfanView STILL becomes the default Image viewer! But then also many file associations are lost!!! this is a user-to-user forum. Irfan Skiljan, the developer of IrfanView, is not involved. You may want to send your bug report to him. When you view a picture, goto 'Help > About IrfanView' for his mail address. OK, doing this right away. But I thought forum users should know!!! The thread is tagged as pending so there is no need to report the bug again. Last edited by Bhikkhu Pesala; 16.03.2019 at 02:12 PM.